Home Security Contracts: Did You Read the Fine Print? One of the first things consumers need to understand about the home security industry is that there is no such thing as a free alarm system. We are a legitimate business. We don’t “steal” our equipment. Our employees all get a salary and benefits. The alarm equipment, service personnel, installation and monitoring all cost alarm companies money. If you are signing a three-year contract at only $30.00 per month, then nothing is being given to you for free. The only reason that three-year home security contracts exist are to satisfy repeated consumer requests for “easy monthly payments” rather than having to immediately pay the entire cost of the alarm system “up front”. If you read the fine print, you cannot cancel a three-year home security system contact without being required to pay 80% -90% of the outstanding balance. Why? Because you haven’t completely paid off the money (investment) it actually cost to supply and install your alarm equipment. The misunderstanding I see being created within the industry is that some companies continue to promote “free alarm and only $30.00 per month for monitoring”; this does not readily, nor clearly, explain that the client will only complete their financial obligation for the equipment and services they have acquired in three years time. Additionally, since very few consumers actually read the fine print before they sign a contract, they are shocked to discover what they consider as “excessive cancellation fees” when they try to “stop their monitoring” before the contract term is up. Understand that if you decide to sign a three-year home security system contract, you should read all of the fine print before you sign to prevent misunderstandings. Alarm companies are not trying to “rip you off”; they are simply trying to re-coup their investment. 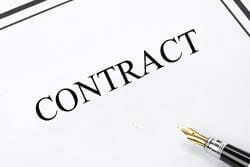 Contracts are entered into in good faith and the consumer is expected to honor contracts which they have signed. You can cancel the contract after the three year term. Read your particular contract to see its specific requirements before you sign it. Consumers can always choose to deal with a home security system company which doesn’t tie you into a three-year contract provided that you pay for the supply and installation of your alarm equipment, in full upon completion of the job. An additional benefit may be the reduction of costs associated with monitoring after paying upfront for your alarm system. Typically this type of monitoring contract will only be for a one-year term, or on a month-to-month basis, with much easier conditions to “stop the monitoring services” if you lose your job. Do your homework and shop around for home security system monitoring providers, as this is a very competitive market and the quality of services offered is not necessarily equal. This is so important that it bears mentioning again: Before you sign anything, read the fine print. From our research these terms vary by company, so be sure to ask these questions. If you get a hard wired system, note that it will be more costly to move than a wireless system you install and are familiar with yourself. One of the advantages with a self-install system is that there will typically not be a moving fee (since you’re moving it yourself), but make sure and confirm this with your alarm system representative. You should also find out what your contract options are. A 1, 2, or 3 year contract option gives you more flexibility, in the event that you’re not happy with your system or alarm provider. If you are content with your security system company, you will get the best pricing when you sign a contract for 3 years or more. The advantage of a DIY security system is that you should be able to move it to your new home for free (since you’re moving it yourself), and have a much easier time doing so than you would with a hardwired system (may require patching up to cover up drill work, not to mention the additional work of re-installing at your new home). Most alarm companies that professionally install will charge you for a new system, or require you to sign a new contract, when you move for this reason. Either way, feel free to check out our top home security reviews for more details on specific security companies.